A couple days ago, Jennie entertained us all with her fantastic description of how she went from shaking her head about the gaming habit of the male part of the family to becoming a keen racer. 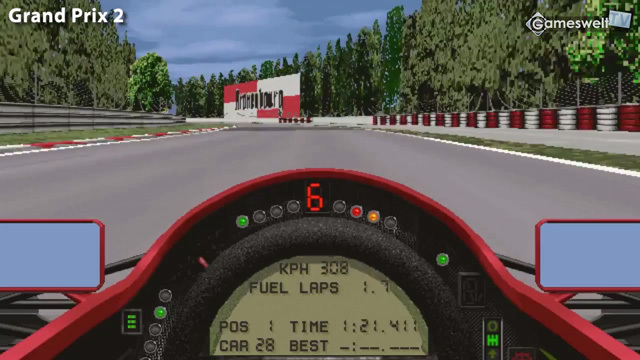 The lively debate that followed revealed that we seem to have quite a selection of armchair racers among the regular crowd, which is why I decided to look at the broader spectrum of racing on a computer. Those old enough to have children, who’ve already started dating, will remember the start of what is now par for the course in just about every household in the western world. One or more consoles or computers are installed with the sole purpose of running video games of some kind. And what a flashy world it has become over the years. You can become an airline pilot without any real danger of throwing away several Million dollars worth of metal and a little village’s worth of human lives if your definition of a stabilized approach is somewhat more liberal than regulations suggest. You can be Captain Cork, who whizzes all over the galaxy to whoop all alien behinds of those who don’t kneel before your magnificence, while bedding all females, who didn’t run fast enough and later the ones who did. You can even be a racing driver. As soon as computers were fast and powerful enough to display more than two paddles and a ball bumping between them and no longer cost the GNP of third world country, game producers started to think of ways to let their users leave their tedious real life and jump into a digital dream. Owing to the fact that the computers of that time would lose to a wrist watch of today in the computing power stakes, the first games needed a lot suspension of disbelief, but it didn’t stop people using them. 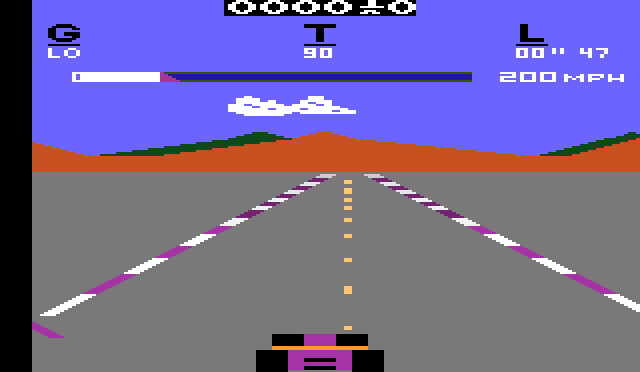 One of the early successes was Atari’s Pole Position, released in 1982. Frankly, from today’s perspective the cars and tracks looked like they were the result of someone knocking over a bag of Lego’s and the colour limitations of the then prevailing CGA and EGA cards made the game an acquired taste, but the seeds were sown – a genre was born. Throughout the 80s and early nineties IBM & Co were busy trying to teach their computers to add 1 and 1 and come up with something other than eleven and once that was achieved they worked on making them faster at doing that. That means progress was relatively slow until the early 90s, when PC makers decided that computers would be better at their job if they stopped slogging along at 16 bits with a measly 640K of memory. In came one man to revolutionize the genre – Geoff Grammond. He was the first to decide that if you wanted to make a realistic Formula One game, you need to teach the computer the laws of physics. Where early games were basically just sprites running over a background, Grammonds legendary F1 Grand Prix series, which had 4 generations (1991, 1995, 1998 and 2001) was the first to try simulating a car’s physics. And from GP2 onwards they were spectacularly good at it. So good in fact that Jacques Villeneuve used it to learn most of the tracks before coming to F1 in 1996. That set off something that would start half an industry. A company called Logitech, among others, realized that with games becoming more and more realistic, people would soon no longer be content with steering their cars with a joystick and they started offering realistic wheel and pedal sets. These days you can buy whole rigs with a racing seat and controls installed. I know of one person, who purchased a disused Formula Renault 3.5 monocoque to install bespoke pedal and steering wheel assemblies to play racing games. Another man with a revolutionary idea was Kazunori Yamauchi, who realized that people might like Formula One games, but basically men are oversized children and the more toys you give them, the happier they are. He and his company Polyphony Digital thought up a game which had hundreds of different cars in it – from a puny Subaru 360 to the mighty Pikes Peak winning Suzuki Escudo. The GranTurismo series of games was born. On Dec. 6th 2013 it spawned its sixth generation. And it’s not all dreaming either. 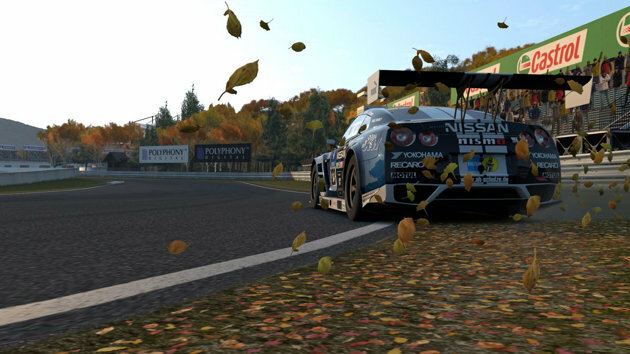 A few years back Nissan decided to see what those console warriors are really made of and created the GT Academy, a series of challenges for people, who qualified in computer game races, in real cars this time. One of the first winners of the Academy is Spaniard Lucas Ordóñez, who by now is an established Sportscar racer and among other successes has a class victory in the Nürburgring 24h race to his name. Another GT Academy winner has recently been signed to the Red Bull junior program. Arguably the closest one can come to running such a race is not doing it spread out over different parts of the world, connected by the interwebs. The real deal is meeting up in a location with all teams, hook up the consoles and have a go at it. That’s what happened in early November in Andernach, Germany. Invited were 15 teams, consisting of three or four drivers to compete in the Nürburgring 24h, an iconic race, which runs in early summer on a gruelling 22km track, which combines both the Grand Prix circuit and the legendary Nordschleife route. It is a testament to the amazing computers of today that such a track is available in almost photorealistic detail, complete with simulated day- and night time and changing wheather. You know things are serious, when you see the teams arriving all carting in seat and wheel assemblies, which cost north of 500 Euro’s, some were custom made. One team even designed their own special rig. Heavy favourites for the win, team GTRP had designed and custom built an own rig that theoretically would allow them to change the complete wheel and pedal sets during a pitstop as the drivers preferred different makes of wheel/pedal assemblies. The sheer madness of the idea to change an assembly that usually takes 10 minutes to install, in under 60 seconds raised more than a few eyebrows with race control and competitors alike. That alone shows that the sheer competitiveness of the human being is not confined to the real race tracks. Being part of race control myself for the weekend, I was about to find out, just how difficult a job it is for those race stewards, who the gavel wielding one so dearly loves to slag off, whenever they make a decision he doesn’t agree with. Even with just 15 cars on the track – as opposed to almost 200 during the real race – it was a difficult job, not only because of the long hours, but also because we had to do the job football referee style, without the benefit of an instant replay. The cars used were Japan SuperGT cars – Nissan GTR’s, Honda NSX’s and Lexii SC-whatever, and shortly after the start the Yellow-Hat GTR of team GTRP was seen impacting the armco in a non-traditional fashion and race control was to decide whether it was a racing incident or foul play as the off track excursion happened during an overtaking move. Thankfully it was a clear cut case, which should not be the case for all later incidents. Yep, they did it in 38 seconds! The applause at the end wasn’t only the spectators – it was the competitors, too. Over the course of 24h GTRP did not only manage to fight back to the front, they lapped all but one car – on a 22km track! In the discussion about Jennie’s article, someone asked how it can be that a game that was released a decade ago can still be run with current data. The simple answer is: There were enough fat hippos and other socially awkward creatures around, who managed to find out where the data are stored and how to modify them. It’s a task straight from the olden days. You have something with no documentation whatsoever, need to decode it and then create a tool to modify them. 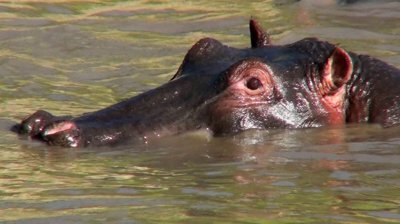 If you recall last weeks splash from the pond, you’ll remember that the Hippo doesn’t think the current generation of computer kids is any good at anything, when it comes to good ol’-fashioned programming. One part of the equation is the watering down that has gone on in our education system. While our A level (Abitur in German) was a gruelling slog through over 10 exams of which you were not allowed to fail a single one, today they’ll send you on your merry ways with a graduation if you can clap and sing simultaneously without drooling or falling over. But one thing I didn’t put into focus is the bad influence the internet has had. While it makes it possible for a fat German to make his opinion known to people, who 25 years ago were the class enemy of our marxist-leninistic socialist society, it is also the reason why our kids do no longer grow up with a deep geeky understanding of their computer and how it works – they don’t have to. When a buddy of mine and me needed something to display PCX images stored on his Amiga 500 on my 20 Mhz Triumph-Adler PC, we needed to debunk the PCX file format, write a decoder for it and some program to copy data from an Amiga to PC via a serial null-modem cable. Todays kids would simply klick on this link. That means, kids today learn to use info that is already there, while we were spectacularly good at re-inventing the wheel, since I surely wasn’t the first to write a PCX decoder. One might argue that we just re-invented stuff over and over and were generally just ineffective and I’d say: You’re right. But – there’s always a but – since we were forced to re-invent the wheel due to lack of communication tools like the interwebs, we learnt how to invent and build a wheel, while today’s generation is a wee bit effed if they need a wheel and the shops are closed or the interwebs go down. After having re-invented routines to display PCX and TIFF files by ‘decoding’ their file-formats with a hex-editor, I had become quite efficient at finding undocumented data in bigger files with no documentation of how they’re stored. That talent is spectacularly useless these days as most info is documented somewhere in a forum or on a website, but back in 1996 it made a huge difference. 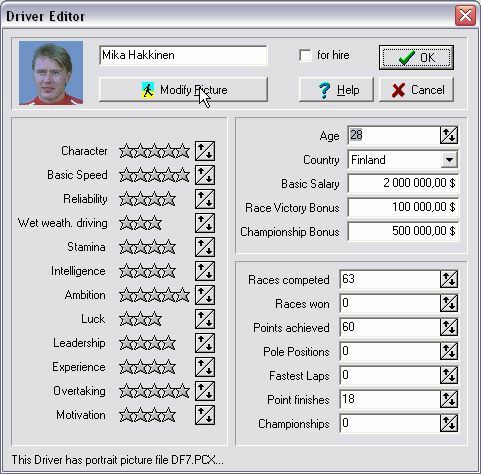 Shortly after the revolutionary GP2, Edward Grabowski released Grandprix Manager 2, a game for people, who would prefer to be Jean Todt instead of Jean Alesi. Like all games at the time it came with a specific set of data – the 1996 season in fact – so about a year after the release it became slightly useless as there was no way to update it. I was particularily disappointed by the fact that the 1996 drivers where in there, but the pool of hireable drivers consisted entirely of fantasy names and the faces of people from Microprose. You can probably see where that’s going. Six weeks later I had worked out where the data were stored and had decrypted the game’s proprietary EDY graphics format. I sat down, wrote an Editor for it – another four weeks – and then had a group of people test it – that took 8 weeks. After 3 months I had a working editor and published it on the interwebs. What I didn’t expect at the time – it is still in use today and I’m working on a remake. For a game that was written to work in Windows 3.11 with a Win32 extension! brings Lewis into a game that was released 11 years before his F1 debut. 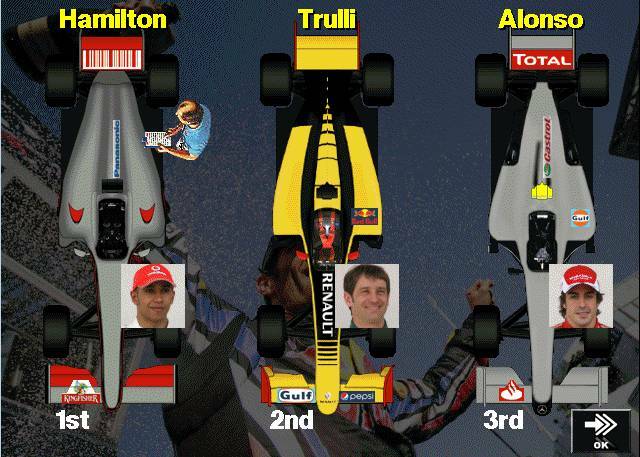 The same happened with GP2 and later GP3 and GP4. People soon found out where the data are stored and Steven Young wrote the GP2 Carset editor, allowing people to update the team and driver roster to whatever was the current year. Someone else found out, where and how the 3D models for the cars were stored and people could upgrade the cars with, lets say, hideous noses. And about 3 years after GP2’s release someone even more geeky than the enormous amphibian decrypted the track files and wrote a track editor, allowing people to recreate tracks that weren’t part of the original game. At the turn of the century one could impersonate Giancarlo Fisichella, driving a Jordan around Bern-Bremgarten circuit. None of that was part of the game’s initial release. As a result of that, games that were meant to be sold and played for about a year suddenly had lifetimes of a decade. GPM2, released in 1996 is still played today and there are still people racing in GP2, GP3 and GP4. I like that one of your cars has 3 oil company sponsors! I never dreamed that my tale of struggling to race computer F1 cars would keep us all entertained for the whole week:) My very first experience with racing games was way back in 1986 when my then boyfriend (but now husband) programmed a car racing game on a VZ 200. The “cars” were only blips going around a track had had no curves – everything was right hand corners. Really loved your extension of the topic but it does make me want to play a racing game instead of do the washing and pack to leave for Melbourne…. This VZ game wasn’t ‘grand prix’ – the car racing game that got published in ‘the first book of VZ200 games’ was it? I still play Grand Prix 3 to this day as I’ve never found a substitute that i felt was better than what can be achieved with this game. I can race championship seasons anywhere from the 50’s up until 2013, on pretty much every GP track ever used. I can make up my own championships, using my own cars, shapes, liveries, sounds etc, and race on tracks not just from F1, but from Indycar, Touring Cars worldwide, and plenty of well made fictional circuits too. It’s certainly an outdated game in terms of graphics nowadays, but it’s not too bad, and the driving ‘feel’ of the game is, in my opinion, something that’s never been bettered. I’ve mentioned on here before, the games are pretty realistic now, i have Logitech steering wheel, that i’ve had for the best part of 10 years, and unfortunately it has a mind of its own now, a straight line is a challenge for it now and i can’t afford to replace, anyway enough of the sob story….. Turns out it was close enough to the real thing that when i first sat in single seater, it felt just like the game, so much so that my brain associated it with my logitech experience rather than real driving and I as barrelled down to the first corner and stamped on the clutch with my left foot(expecting it to be the brake), just like i would on a computer game, 3 laps later and i was braking with the correct foot. In the 15 mins I was out there, I lapped everyone, but that’s not cause I believe I’m super talented, its because I’ve spent the last 10 years playing racing games which are close enough to the real thing for me to do, monkey see, monkey do. I think its also quite possible it stopped me putting my car in a ditch too the other day, whilst nipping down a country lane, with a “rhinestone cowboy” on full blast, having fun sliding the car around, all of the sudden the back catches a bit of mud, turns the car sideways, fires me straight at a grass verge, goes air born towards the field and ditch, catch it as it lands, now flying along the grass verge with a ditch to my side, clearly brakes aren’t working on grass and mud, keep my… foot in launch the car air born again, catch it as it lands back on the road and carry, just need new some new boxers. I’m completely convinced its years of playing racing games that saved me, and it was pure muscle memory, as everything I did was subconscious and I didn’t panic, just repeated what I been doing on racing games for years when I fall off the track and the grip disappears. Very interesting – to someone who had NO knowledge of such things. Toca 2 was also an excellent game! I do love your bits and pieces Hippo- but a 24 hour LAN party? Really? Are people actually doing this? Grand Prix Legends is the definitive example of this world of customizations. Released in 1998 it was a failure in the marketplace due to it featuring cars and tracks from the 1967 Formula 1 season (including the mighty Nurburgring), and so was impossibly hard to drive. However a core group of enthusiasts got addicted, found each other over the internet, stuck at it, and got ideas. And so it grew, and grew, and grew. Today GPL has over 600 tracks available to download, and extra cars for F1 seasons 1965, 1966, and 1969 have been added. Along with 1967 Le Mans cars, and 1971 CanAm cars, and even F2’s and Indycars. Leagues around the world exist and offer online championships people can compete against each other in using the different mods – made easier thanks to software made to show races. GPL is the greatest racing sim ever. And all you have to do is buy the initial CD off the net, *everything* else is free to download – from the wonderful people who dedicated themselves to improve it and share it. Can’t wait to try your new GPM2 editor! I still muck around with the current one, creating recent years since the ones freely available on the net.. always 78 drivers to edit! I’m definitely one of the ‘new gen’ kids.. I do wish I had gotten into programming, but the provision for this via education in the UK is terrible. I had a modern PC at home, but in primary school there were 80’s BBC computers and only one in each classroom (they were only used for games – so that’s all I used them for). Since 2000, things have improved, but only now are there plans to make ‘computing’ a proper subject on the national curriculum.